SpaceQ Space news and analysis. Concept image of a Kleos satellite. Credit: Kleos Space S.A.
Kleos Space is looking to build a satellite constellation that will collect radio transmissions data that is currently hidden from detection for commercial and government civil and defence clients. The company has signed GomSpace to build the constellation of 20 satellites, with the first set of up to three nanosatellites ready for launch by mid-2019. Last week, the company announced that Rocket Labs had been contracted as their launch provider. Kleos a fascinating startup. It’s founders are British, but decided to base the business in Luxembourg and then go public in Australia. The company has already won contracts and has begun to build its new Data as a Service (DaaS) platform called Guardian ABI (Activity Based Intelligence). Listen in to the weekly SpaceQ Podcast as I talk with Andy Bowyer, co-founder and CEO of Kleos Space. You can subscribe to the podcast using your favourite podcast app (iOS and Android). For apps like OverCast or Pocket Cast you can search using the podcast title SpaceQ or use the RSS feed URL listed below. The podcast is also available on Apple Podcasts, Google Play Music and SoundCloud. Boucher is an entrepreneur, writer, editor & publisher. 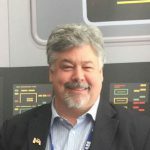 He is the founder of SpaceQ Media Inc. and CEO and co-founder of SpaceRef Interactice Inc. Boucher has 20 years working in various roles in the space industry and a total of 27 years as a technology entrepreneur including creating Maple Square, Canada's first internet directory and search engine. SpaceQ - Your number one partner for reaching Canada's innovators, influencers and decision makers. Learn more and contact us.